Since 2016, Aloha United Way has served as one of several VISTA intermediary organizations in Oahu as a partnership with Corporation for National and Community Service (CNCS). We currently recruit and place 19 VISTA in local organizations. There are two other intermediaries and several single site organizations that also sponsor other VISTAs on Oahu and the neighboring islands. VISTAs serve a year-long, full-time commitment on a specific project at a nonprofit organization or public agency. In return for their service, AmeriCorps VISTA members receive a modest living allowance and have the option to receive a Segal AmeriCorps Education Award or post-service stipend after completing their service. VISTA members generally do not provide direct services, such as tutoring children or building homes. Instead, at the direction of their host organization or agency, VISTAs focus on building the organizational, administrative, and financial capacity of organizations. Aloha United Way’s VISTA program primarily focuses on advancing the capacity in data collection and evaluation of Hawaii’s nonprofit sector. VISTAs placed through Aloha United Way strengthen their organizations in developing and implementing effective and sustainable programs. 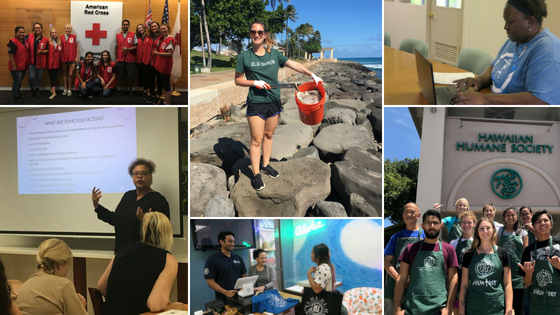 If you are interested in joining AmeriCorps VISTA or just want to know more about the specific positions we offer, please contact VISTA Program Manager Sarah Murray at sarahmurray@auw.org or call (808) 543-2249. We look forward to hearing from you. If you have questions about our AmeriCorps VISTA program, click here for a list of frequently asked questions.